Wool jacket with velvet trim and pearlescent-bead embroidery. Gucci nylon jacket in rainbow feline head print. Hooded collar with drawstring edge. Two-way zip front. Long sleeves; elasticized cuffs. Gucci nylon jacket in rainbow feline head print. Hooded collar with drawstring edge. Two-way zip front. Long sleeves; elasticized cuffs. Patch pockets at hips. Made in Italy. 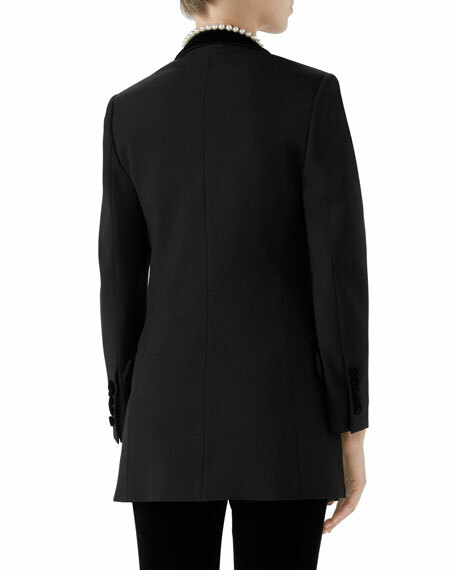 Gucci jacket in stretch cady with contrast grosgrain trim. Notched lapel; feline-head metal button front. Long sleeves. Patch pockets; interior pocket. Logo, hearts and clover printed lining. Viscose/spandex. Made in Italy.